Unique gifts made of wood like wall art, novelty motorcyle and more. Macrame Rope & Wood Hanging Shelves. 2pc minimum. Must order in increments of 2. 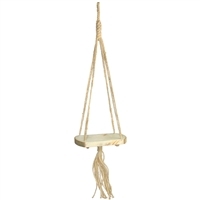 Macrame Rope & Wood Hanging Shelf. 4pc minimum. Must order in increments of 4. 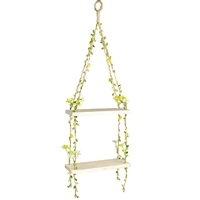 Macrame Rope & Wood Hanging Shelf with flower vine & butterflies. 4pc minimum. Must order in increments of 4. 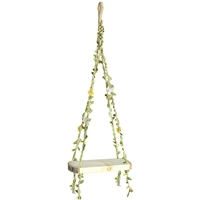 Macrame Rope & Wood Hanging Shelf with flower vines. 3pc minimum. Must order in increments of 3. 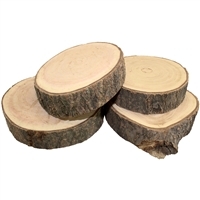 Natural untreated wood coasters... or use as display pieces for jewelry, etc. Assorted pieces range in size about 3.5 - 5" diameter. Bamboo Chime with 12 tubes 48"
Bamboo chimes create soothing island sounds with traditional style. Cat Wood Carving - Decorative and a ring holder! Hand crafted chopsticks are made of exotic woods with beautiful inlaid desings. This set include the natural paper sleeves. Hand carved graceful hand to use as art piece or jewelry stand. Elegant carved hand with painted flowers and butterflies. Can be used as decor piece in any room of the house! Commonly used as ring and jewelry holder! These hand crafted chopsticks are made of exotic woods with beautiful inlaid designs and some have turned carving. This set of 50 pairs does not include the sleeves. One dozen coasters stacked and tied with rope.